NarpsUK hosts a series of unique and comprehensive online courses produced by experts and specifically for those wishing to start, or who already run, their own pet sitting or dog walking business. Online learning is a great way of educating yourself and allows you to gain certification whilst fitting the course around your own life and busy schedule. You have 12 months to take any of our courses which you can go through at your own pace and at times that suit you. Once you have completed any of our courses you will receive a downloadable certificate to show to prospective customers. If you are taking the NarpsUK Pet Sitting and Dog Walking Full Course, you will receive hard copy NarpsUK certificate embossed with the National Association of Registered Pet Sitters and Dogs Walkers gold seal as well as a separate certificate from Uk Rural Skills - the National Awarding Organisation for the UK Sector Skills Council for Land Based and Environmental Industries. We will also send you our digital emblem to use on your website and on your website and literature. "I completed the course on Saturday & really enjoyed it, especially from module 4 onwards. Some really good pointers on how to improve business. I wish the course had existed 6 months ago when I set up. It's invaluable for the novice"
"I've now completed the first three modules and have found it very informative. 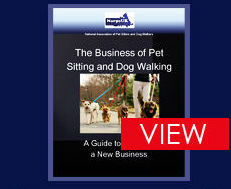 So far I have found it very clear and easy to read and am looking forward to moving on to the next modules"
The NarpsUK Pet Sitting and Dog Walking Business Course is a unique and comprehensive course produced by experts specifically for those wishing to start or who already run their own pet sitting or dog walking business. The course has been co-written and accredited by Uk Rural Skills Awards which is a nationally recognised awarding organisation with over 40 years of experience. This course examines the basics of first aid. It will look at the different ways that dogs may be injured and the appropriate first aid response in each case, as well as further steps to take even if the dog gets well quickly. This short course looks at the basic building blocks of starting your own pet sitting service in order to succeed in the pet services industry. Learn how to send the right message to potential clients and how marketing and advertising can be effective and affordable. This short course concentrates on the clerical work involved in a pet sitting business. Including: Storing clients details- Taking Bookings – Structuring your business – Setting Prices – Confidentiality – Scheduling – Managing Accounts and more! This short course looks at insurance for the pet sitter and dog walker, and the areas of animal law and legislation that you will need to know. This short free course gives you the opportunity to see how our courses work and what to expect before purchasing one. This also covers ‘Is Pet Sitting or Dog Walking Right for You?’ allowing you to make a decision on whether this business would be suitable for your lifestyle, and for you as an individual. This short course outlines the forms you will use for your business alongside a brief explanation of when they should be used. When caring for animals it is useful to have an understanding of their characteristics, both physical and behavioural. This course will help you to improve your knowledge of these. This short course covers the basic health care of dogs, cats and rabbits. It will look at routine health checks, common conditions, preventive treatments and zoonotic risks to people. This short course examines feeding and nutrition for dogs. There is also a section which covers Grooming. This short course will look at how you can run your business ethically and correctly, by clearly setting out policies, being transparent and managing your business relationships in a professional manner.